I regularly record video at a local co-working space that often has talks & presentations. I'm facing an issue with presenters not bothering to use a microphone (even when I put a lapel mic on them, they take it off or leave it on mute! ), or when they do, not using it properly. Often there's groups of 3 people who talk for only 5-10 min then another group comes on and then another 3 people - giving everyone a lapel is a bit expensive, but mostly tricky for me as a single video and audio operator to mic everyone up whilst recording a live event. The room isn't that big, so even though there is sound reinforcement which makes hearing them much, much easier for those at the back, it's not entirely necessary, so when nobody uses a mic or isn't using it properly, nobody says "hey I can't hear you!" to force them into using it. It's so frustrating that the presenters simply don't use the microphone - they're too busy worrying about their presentation to bother. Now my concern isn't so much the sound reinforcement, but recording quality audio for the video and I'm trying to come up with a hassle-free solution to record clean audio of these presenters in this situation! I've drawn a diagram to explain the room. 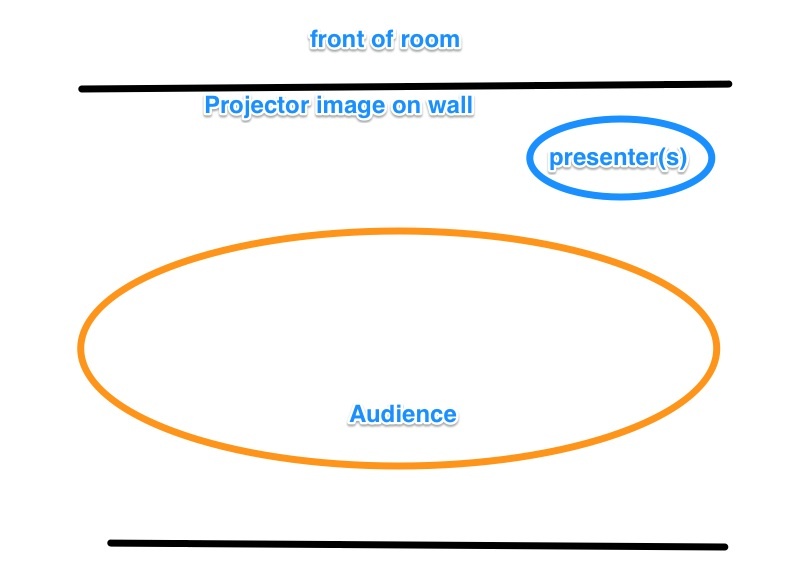 The presenter(s) generally hang out in a 3m-4m x 1m area to the right of the projector screen and walk around there whilst presenting. Often they'll go right infront of the projector screen to point at something (instead of using a laser pointer). 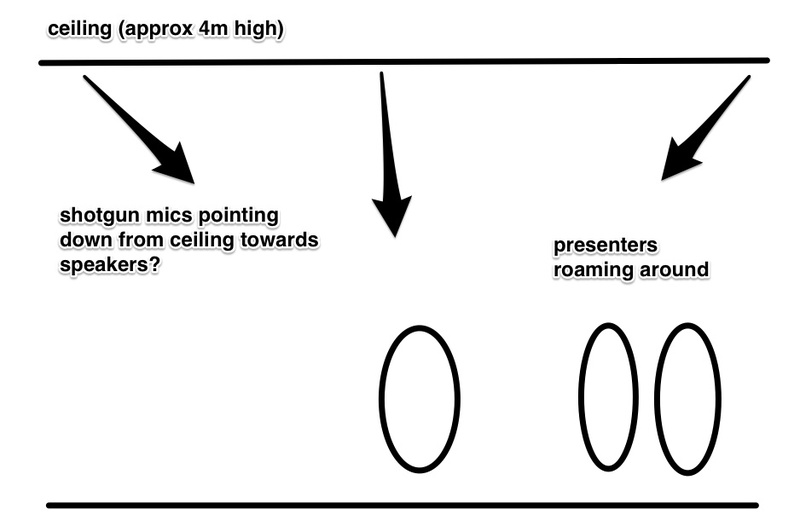 Looking directly at the front of the room, the ceiling is about 4m high and one solution I'm thinking of, that's entirely passive for the presenters, is to hang shotgun mics from the ceiling, pointing at the general area they're in. Two or three Rode NTG2/NTG3 (maybe NTG8?) mics may do the job? Using the shotgun mics from the ceiling, I am worried about phasing and the other off-axis mics picking up background noise instead of the person speaking. As well as the mic being too far away from the presenter to capture it clearly. Am I crazy? Is there a better way besides giving a lapel/headset mic to every speaker? Re: Using Shotgun Mics On Ceiling to Record Front of House Presenter? Yes. You are crazy. Hanging one or more conventional shotgun mics from the ceiling is unlikely to produce the desired result. There are many reasons for this if you want to get into the details. In similar situations, my technique has been to have a serious discussion with the program producer and educate them that if suitable cooperation from the presenters is not possible, then it will simply not be possible to record the meetings. Period. End of discussion. Ball back in their court. Sometimes I (as the videographer in the back of the room) am the one who shouts "use the microphone, we(*) can't hear you!". If you do that EVERY time one of them gets up to talk, they may eventually get a clue. (*) In this case "we" includes not only the live audience in the room struggling to hear, but ALSO the audience listening the recording at some subsequent time. Maybe the point of this post was to talk me out of it, as I know it's not a good idea. Good lav mics aren't that expensive and would work way better. But this shotgun mic in the ceiling idea came from the client as they think it'd be easier than placing mics on people.. so I thought I'd at least think about it, but the more I think about it, the more "wtf" I get about it. Shotguns still need to be close to the sound source for proper pickup, 20 inches or so is good. Hung from the ceiling they'll be too far away, plus the presenter will continually go on- and off- mic as he moves around the stage. This is one of those situations where you might not get good sound but you can get clear sound. I don't think your plan would work without some mixing going on either in post or live. I have some Shure Fp 410's which can choose the best mic presence from all the inputs and this is one of those situations I met set up a dedicated channel to those and still have the podium micced separately. When I do Theatrical shows where the actors are not micced they often use floor mics to catch the sound all over the stage. We usually add 416's to cover the stage and get audience applause as well. Not as good as having everyone micced but clear enough. Record as many different tracks as you can so you can improve it in post. As far as overhead mics you might want to look at better solutions than the Rode. Schoeps and Sennheiser might be worth renting to see the difference. Paying a person to point a mic in the right direction at the front of the stage towards the speaker might be worthwhile as well. 2) Shotgun mics are NOT like "zoom lenses" where they can converge on a small angle and "magnify" it to fill the "frame". They can ONLY REJECT sound from the sides and rear (remembering #1 above!) So if they are more than ~60cm/2ft away, they are simply TOO FAR AWAY to pick up what most people would consider "decent" audio. Audiences will put up with poor video quality, but if the audio is distant or echoey, it is a prime indicator of sub-standard production and audiences will quickly tune-out if they have to struggle to hear or understand the talker. 3) Microphones in general (and shotgun mics even more) do not "hear" like the human ear/brain system. They are unable to automatically compensate when the talker turns his/her head. So they must be (ACTIVELY) kept "aimed" at the talker's mouth. And, alas, using multiple mics (even if #1 and #2 were not issues) to "cover all the angles" creates a mixing nightmare. The difference between the "good" angle (and I use that term with great reluctance) and the "bad" angles is not great enough to use an automatic mixer solution. And doing it by hand is a difficult task and requires skilled crew. AND (if you need more!) all of this assumes that you are talking ONLY about recording. Using any "distant" mic technique is COMPLETELY USELESS for reinforcement ("PA") coverage in the space. People are bombarded with video and accompanying sound 7x24 from television, movie theater, etc, and they assume that getting audio that good is somehow "magic". But there is no magic involved. There are tricks that are used behind the scenes, but NONE of them involve passive micing from a distance. You simply cannot violate the laws of acoustic physics and expect to get away with it. If your subjects are projecting properly into the audience and not turning their backs (to write on the board, etc.) then you may get away with theatrical techniques as Mr. Epstein suggests. But note that it is equipment and skilled crew intensive. And neither of those conditions appear to exist, judging by your description. This has been discussion in depth many times previously, the OP should search this and the DVX audio forums to save us from repeating whats already been posted a hundred or more times. I concur with Richard, many folks, including most videographers, assume sound just 'takes care of itself'..
From a technical perspective, I agree with Mr. Crowley. Standing in the back of the room, and yelling, might work. Then again, it might result in someone else getting the contract. I'd want to feel pretty confident about my client before I did that very often. But if it works for you (or for Mr. Crowley) then more power to you. Perhaps your client needs to understand that if he wants good audio, he needs to budget for an audio assistant in the front of the room, who will see to it that the three (or more) mics are removed from the last set of presenters, and are put on the next set of presenters. That's how it's done in the theatrical world: the main audio person is in the back of the room mixing, there's an assistant offstage handling the wireless mics. It's so frustrating that the presenters simply don't use the microphone - they're too busy worrying about their presentation to bother. Some presenters can have either the nervousness or the ego of actors, but not the professional understanding of the technical situation. That's a huge area. No audio shortcuts or miracles in there! If you think you can get good audio without effort, you need a reality check. Almost any "good" result requires intelligence and effort, and audio is no exception. Last edited by Greg Miller; March 24th, 2014 at 09:57 AM. I'd want to feel pretty confident about my client before I did that very often. But if it works for you (or for Mr. Crowley) then more power to you. Indeed. I use that method in cases where I have already had "the talk" with the program producers and they have agreed to taking the measures required for decent audio. But, being amateurs, even the MC (or whomever is playing the role of "mic wrangler") forgets and I have to remind them. I was hired to make sure we get a good record of the event, and they understand the tradeoffs. Of course, proper judgement should be used to decide when/where it is appropriate (or not). he needs to budget for an audio assistant in the front of the room, who will see to it that the three (or more) mics are removed from the last set of presenters, and are put on the next set of presenters. That's how it's done in the theatrical world: the main audio person is in the back of the room mixing, there's an assistant offstage handling the wireless mics. Yes absolutely. In many productions I do (and watch) there is a semi-official crew position called "Mic Wrangler". They have production intercom communication with the person operating the venue (house/FOH) reinforcement system, as well as the production mixer handling audio for the TV production. That's a huge area. No audio shortcuts or miracles in there! If you think you can get good audio without effort, you need a reality check. Almost any "good" result requires intelligence and effort, and audio is no exception. Is there a better way besides giving a lapel/headset mic to every speaker? No. For the situation you describe, putting an omnidirectional lavalier on each presenter is the best answer. The lav doesn't have to be hidden. It should be relatively quick to clip a mic to them somewhere on their front, and drop a body pack transmitter in a pocket or clip to a belt. When they leave the stage take it off, and and use it to wire up the next presenter. Doing this by yourself may be problematic -- might be worth it to pull in an assistant just to do lavalier setups / teardowns. As to presenters not cooperating... The presenters don't work for you, they are the client's responsibility, so make the client responsible. Getting wired has to be part of the presenter's job. As to using shotgun mics in an enclosed space... Read up on how an interference tube works, and why it works poorly close to reflective surfaces. Most shotgun mics use a supercardiod capsule behind the interference tube; look up that polar pattern and imagine what that rear lobe is going to pick up right next to the ceiling. Not good. Said another way: very bad. The only alternative to lavs that I can think of is to work with your client to confine the presenters to a small space so they can't wander around -- say, a lectern confined by tables and chairs. Put an omni on the lectern so they can sway front-back and left-right and not have to worry about getting out of pattern or dealing with any level of proximity effect. I've actually done this, and it worked, kinda-sorta, in a not-great-but-mostly-serviceable kind of way, when a client surprised me on location with a "while you're here..." request -- I did the best I could with the equipment I had with me at the time. But really, the only practical thing is to wire 'em up as they come on stage.